Check your smart phone and table at the door, s'il vous ples! 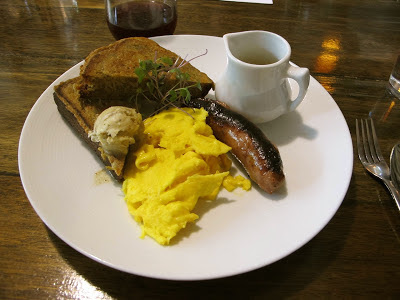 I do take photos of my food, like this breakfast at Sante in Spokane. Photo by Sue Frause. Last night I dined at one of Montreal's many fine restaurants. It was a Sunday night, and the resto gradually filled up with middle-aged couples dressed for the lovely venue. By the time I finished my meal, the place was jammed. Most of the diners were couples. There was only one other solo diner, a young woman. I saw her snapping photos outside the restaurant and when she sat down, she immediately opened up her laptop, complete with bright screen. Throughout the evening she was snapping pictures of her food (sans flash, thank goodness) and typing into her laptop. Bad etiquette, for sure ... even if she is a food blogger or travel writer. If you're at Starbucks or St. Hubert, go ahead. But this was one of Montreal's lovelier restos. Are owners going to have to add this at the bottom of menus? No shoes, no shirt, no service! No outside food! No cigars or cigarettes! No smartphones, tablets or laptops! No flash photography! No baseball caps! No screaming children!